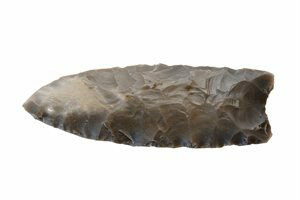 The Clovis culture is named after the town in New Mexico, where distinct stone tools were found in the 1920s and 1930s. New research provides evidence against the hypothesis that a large comet impact or airburst caused the termination of the Clovis culture. Comet explosions did not end the prehistoric human culture, known as Clovis, in North America 13,000 years ago, according to research published in the journal Geophysical Monograph Series. Researchers from Royal Holloway, together with Sandia National Laboratories and 13 other universities across the United States and Europe, have found evidence which rebuts the belief that a large impact or airburst caused a significant and abrupt change to the Earth’s climate and terminated the Clovis culture. They argue that other explanations must be found for the apparent disappearance. Clovis is the name archaeologists have given to the earliest well-established human culture in the North American continent. It is named after the town in New Mexico, where distinct stone tools were found in the 1920s and 1930s. Researchers argue that no appropriately sized impact craters from that time period have been discovered, and no shocked material or any other features of impact have been found in sediments. They also found that samples presented in support of the impact hypothesis were contaminated with modern material and that no physics model can support the theory. “Hopefully new versions of the theory will be more carefully examined before they are published”. Be the first to comment on "Evidence Against the Hypothesis that a Comet Impact Wiped Out Prehistoric Humans"